Have you ever felt that staff development never makes it off the back burner? Let us take the hassle out of a time consuming function and save you money while ensuring you have the most effective development solution in place. One of our experts will work alongside you to source and deliver the right learning solutions at the right price. Whether you need to be compliant with your industry regulation, or to evaluate the effectiveness of your Learning and Development function, we can undertake one off projects for you. Such as an audit of your L&D and a costed plan to help future proof your business with the right mix of people and skills. 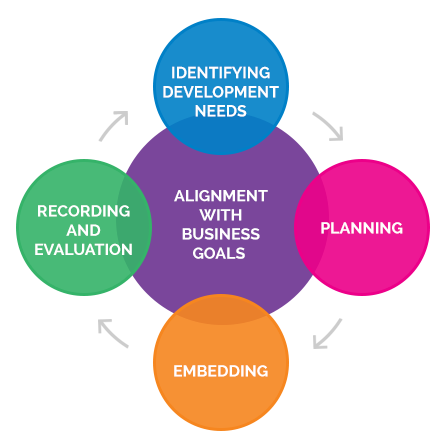 All of your learning needs will be taken into account with our four step process, starting with identification of needs, through to evaluation and embedding learning in your business. Throughout the process we research and recommend many non-course solutions such as knowledge sharing and work based activities. We’ll work with you to develop a training plan, identifying training and development needs using appraisal and stakeholder discussion, through to sourcing and managing your training.